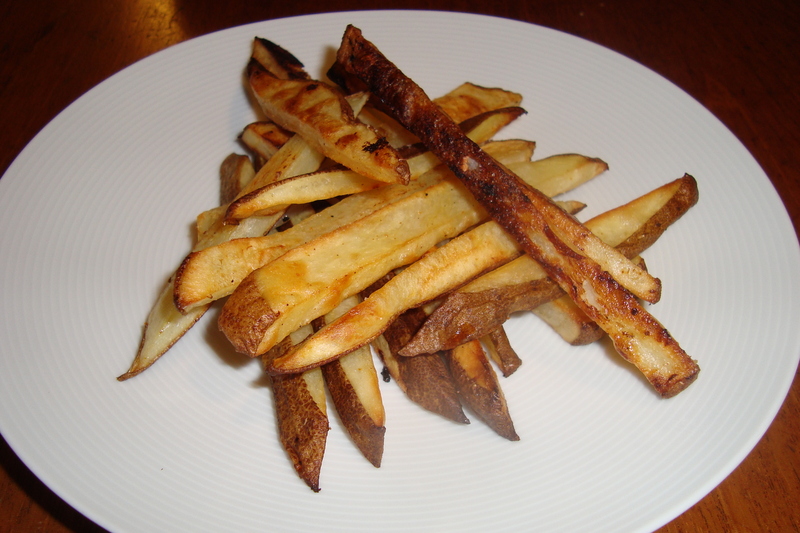 The problem with baking french fries is that they never get crispy enough. When I saw Melissa d’Arabian make them on her show, she added a little bit of sugar to help them brown. I also pre-soaked the fries in ice water to remove some of the extra starch. The end result was crispy and quite delicious. Place the potatoes into a large bowl, then cover with ice water. Allow to soak for 2 hours. Drain and pat dry with paper towels. Preheat oven to 425 degrees F. Spray a baking sheet with non-stick spray. Toss the potatoes with oil, salt, sugar, cayenne, and chili powder. Spread into a single layer on the baking sheet, then bake for approximately 40 minutes or until crisp, turning them over after 25 minutes.